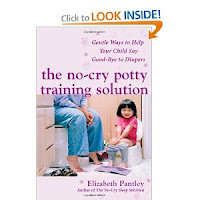 Book Review By MamaLuvsBooks: The No-Cry Parenting Solution Books by Elizabeth Pantley are some of my very favorite parenting books. They are a fantastic series with many ideas and solutions for parents. These books vary in topics from potty training to sleep behavior to discipline solutions. I also love that there are different books for different ages and stages of children. Sleep issues with newborns can be different than those in older kids. There are books for almost every situation a parent comes across and needs help with. 1. Some books have quizzes for parents! 2. There are always concise lists of ideas for parents to follow. 3. The books state facts behind issues for kids and the solutions to the problems. 4. The books are well organized and easy to understand. 5. The books include ready to use information to get you starting right away! 6. The books have tricks and tips for parents. You can get a copy of a No-Cry book as well. Winner gets to CHOOSE whichever No-Cry book they want! This series is a MUST HAVE for ALL parents! I personally own almost every single one of them. At one time or another we have needed help with sleep issues, food issues, potty training problems, discipline situations and more. 1. WIN a No-Cry Parenting Book (winner's choice) in my Book Bonanza giveaway! The author, Elizabeth Pantley, will send you a signed copy of your book of choice. The more you do on the Rafflecopter the more chances you will have to win! Good Luck!!! Don't forget you can also purchase these wonderful books on Elizabeth Pantley's site, or Amazon.com.